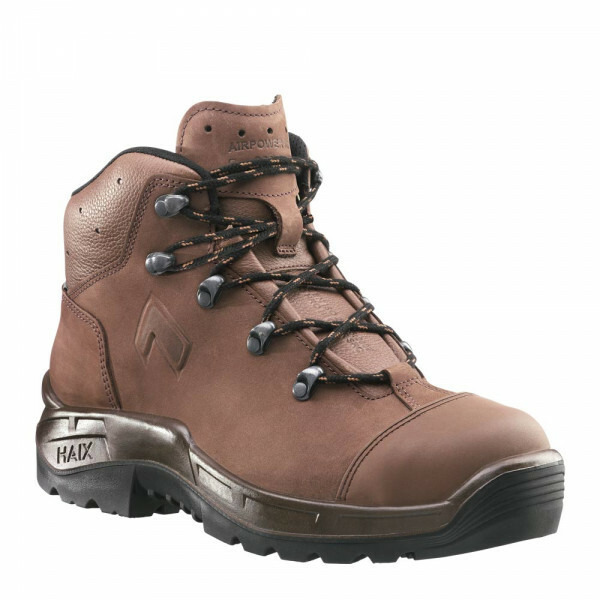 The HAIX Airpower R26 is a lightweight ankle-height shoe which gives a good grip on any surface and offers outstanding insulation against the heat and cold. An integrated GORE-TEX® membrane makes it both watertight and highly breathable. The Airpower R26 provides a perfect fit, supports your joints and affords plenty of room for the balls of the feet and the toes. A wide padded toe cap and a puncture-resistant sole makes it an ideal option for landscape gardeners and tradesmen of every kind. The HAIX Airpower R26 meets the very highest quality standards in terms of material and workmanship. It is manufactured in pure bull leather, a particularly robust and hard-wearing material which provides a superb fibre structure. A high-tech GORE-TEX® membrane contained within the inner lining ensures that your feet will remain dry in the rain, whilst a robust rubber sole provides protection from below. All the materials used are precisely harmonised and connected to make the HAIX Airpower R26 a particularly durable shoe. The Airpower R26 offers outstanding toe-to-heel movement with plenty of room for the toes and balls of the feet at the front of the shoe. It narrows in the heel and ankle area to ensure a firm grip. A flexible rubber outsole and anatomically formed inlay soles both help enhance comfort of wear. An impact-absorbing PU foam wedge contained within the heel cushions your steps as you go and reduces pressure on the joints. You will find that your feet will not tire quickly and will stay fresh and comfortable throughout the whole of the day. The HAIX Airpower R26 is manufactured in the highest quality nubuck leather, a particularly robust material which is roughened to give a velvety touch and specially impregnated so as to be completely water repellent. The leather used is two millimetres thick and will keep your feet dry from the outside as well as allowing them to “breathe”. The number of seams used in the more vulnerable side area of the shoe has been minimised in order to ensure an extra-long product life. An additional TPU cap gives extra protection to the feet and helps prevent wear and tear to the leather. The HAIX Airpower R26 has an abrasion-resistant lining with an inner layer of fleece. Several layers of GORE-TEX® laminate within the lining prevent any water penetration. This protects your feet against the rain and other liquids. At the same time, the shoe is highly breathable. The membrane evaporates sweat and transports it outside. This effect is supported by the HAIX Climate System, which uses the natural pumping motion generated as you walk along to process internal sweat to ventilation slits at the shaft and tongue ready to be expelled. The shaft and outsole is connected by an additional fleece insole, which also helps to absorb and expel residual moisture. A flexible and puncture-resistant sole prevents penetration by any sharp articles underfoot such as nails . The Airpower R26 has a robust rubber sole with a deep tread to provide a secure foothold on any surface. The sole insulates against the heat and cold and is also slip-resistant in winter. It is highly abrasion resistant as well as being colour fast. The latter property means that it will leave no ugly dark marks on light-coloured surfaces. An impact-absorbing PU foam wedge contained within the heel helps promote good toe-to-heel movement. This soft material cushions your steps as you go and thus decreases any strain on the joints and spine. The outsole is resistant against oil, petrol and chemicals. The Airpower R26 can be used as a light hiking boot and also fulfils all the safety requirements of gardening and DIY enthusiasts. It protects you in any weather, provides a firm foothold and provides comfort of wear all day long. Discover the benefits of the HAIX Airpower R26 safety shoe now!